Recently I noted that planned expansion of the Alberta oil sands can not possibly be reconciled with the Harper government’s promises to reduce greenhouse gas emissions over the next few decades. (And Simon Fraser climate policy researcher Mark Jaccard apparently agrees). And I also exposed the ever mounting number of evident links between the Conservative government, including Natural Resources Minister Joe Oliver, and the pro-oilsands EthicalOil.org PR group (a.k.a the Ethical Oil Institute). Now Oliver has upped the ante on both contentions spectacularly. Answering questions from NDP environment critic Megan Leslie in the Canadian Parliament today, Oliver repeated a previously debunked claim that oil sands emissions (not intensity, but actual emissions) have fallen. And he implied that emission intensity (i.e. GHGs per barrel) continues to fall. Those same mistaken assertions were also made by former Ethical Oil executive director Alykhan Velshi in the ironically titled “Myths and Lies” section of EthicalOil.org, albeit with incomplete hasty corrections later on. And Oliver never did come clean on his understanding of climate science, doing little to reverse the impression that anti-science contrarians have gained a significant foothold in Ottawa, and that Stephen Harper’s Conservatives have no intention of meeting their climate commitments. Mark Jaccard is arguably Canada’s foremost climate policy researcher. He was a key architect of British Columbia premier Gordon Campbell’s landmark climate change program, featuring North America’s first comprehensive escalating carbon tax. And he led a comprehensive 2007 modeling study, Climate Leadership, Economic Prosperity that detailed the path for Canada to meet, or even exceed, its GHG emissions target for 2020. So when Jaccard has something to say, politicians and interested citizens on all sides of the climate policy debate generally listen. And Jaccard is speaking out against the Northern Gateway pipeline, stating in no uncertain times that ongoing expansion of the Alberta oil sands, including its proposed network of pipelines, can not be reconciled with Canadian Prime Minister Stephen Harper’s promises and commitments to mitigate climate change. 1) The Keystone XL application has been turned down by the Obama administration, but the applicant Trans Canada has been invited to reapply and will do so. In other words, a final decision has been delayed until 2013, which was the situation before the Republicans tried to force the issue. 2) Hansen et al have released their 2011 review, “Global Temperature in 2011, Trends, and Prospects”. As a once in a generation Canadian pipeline review process gets underway, the rhetoric around the massive Northern Gateway project has heated up noticeably. The Conservative government and the Ethical Oil pro-industry group seemed to take turns ratcheting up attacks on environmental groups opposing the project almost daily. Natural Resources Minister Joe Oliver may have set a new low in his recent attacks on those who would “hijack our regulatory system to achieve their radical ideological agenda”, backed by “foreign special interest groups”, not to mention “billionaire socialists … like George Soros”. The eerie echoes of Ethical Oil’s recent advertising campaign and back-and-forth timing have led some to recall previously discussed ties between Stephen Harper’s Conservative government and key Ethical Oil figures Ezra Levant and former executive director Alykhan Velshi (now safely back in the PMO). But it turns out there are other interesting ties behind the scenes. An examination of the web server hosting EthicalOil.org reveals a network of fifty or so websites, mainly on behalf of right-wing causes and politicians. The latter include two Conservative cabinet ministers, Velshi’s old boss immigration minister Jason Kenney and that scourge of foreign billionaire socialists, Joe Oliver. 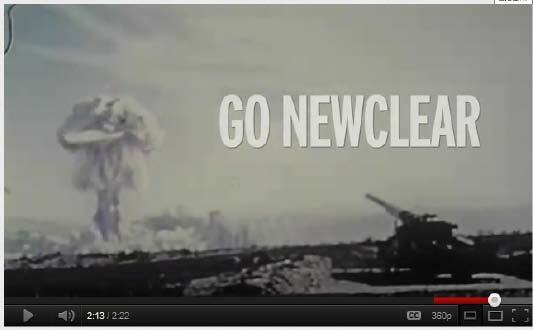 And it also points to the key involvement of Go Newclear Productions, a somewhat mysterious “full service digital agency with a focus on public affairs and politics”. Go Newclear is headed up by none other than political wunderkind Hamish Marshall, already a veteran of both the PMO and the Conservative federal council – and husband of hapless Ethical Oil spokesperson Kathryn Marshall. The other Go Newclear directors /officers (and presumed principals) are linked to the Conservative PR machine known as the Conservative Resources Group; radio and TV advertising specialist Brendan Jones left the CRG in 2009, while developer Travis Freeman, astonishingly enough, is still with the group. Not only that, but the Ethical Oil cluster of websites and Joe Oliver.ca form a distinct sub-group within the Go Newclear network, with unmistakeable signs of common development and a deployment seemingly aimed at obfuscating the link to Newclear team. So there is more than just common ideology tying EthicalOil.org to the Conservative PR machine; they also share digital service providers – and a lack of transparency. “Canada’s message: The world and its climate be damned”. That headline on Jeffrey Simpson’s scathing commentary on Canada’s pending formal withdrawal from the Kyoto Protocol said it all. Writing in the Globe and Mail, Simpson touched on several themes that have become staples at Deep Climate: the Canadian government’s hypocritical excuses for lack of action, the intellectually dishonest “ethical oil” argument, and the continued sly pandering to a political base of “climate deniers and skeptics”. These are all worthy topics to explore in the coming months, especially that last one. But I want to turn today to an analysis of the Conservative government’s putative alternatives to Kyoto, namely the 2009 Copenhagen agreement, as well as the GHG reduction plans put forth in 2008 by Canada and the province Alberta (home to the oil sands and Conservative Prime Minister Stephen Harper). That analysis confirms the contention of Jeffrey Simpson and others that the government of Canada is “mocking” the 2020 target agreed to only two years ago; the promised 17% reduction in annual GHG emissions (relative to 2005) is already out of reach. 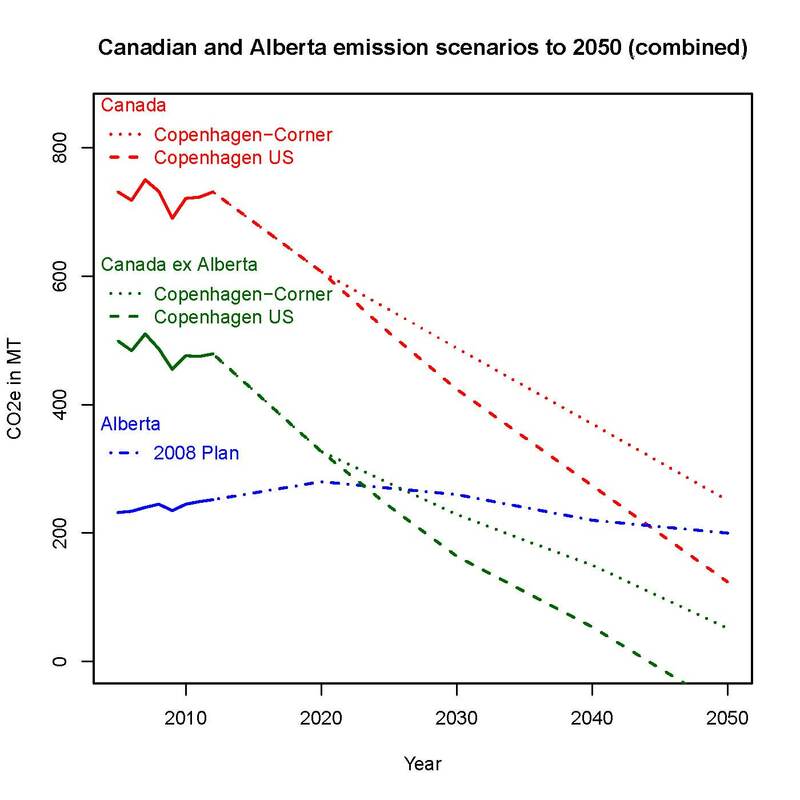 A big reason for this is an Alberta target (itself very unlikely to be met) that calls for a rise in GHG emissions until 2020. Not only that, but Alberta’s 2050 target, predicated on massive expansion of oil sands operations, is only 14% below 2005 levels, and sets Canada on a path that can not possibly be reconciled with the Harper government’s own stated long-term target, let alone any reasonable goal compatible with Canada’s responsibilities.